1.Cut: Make a heart pattern. Cut one 1 1/8” x 4½” (2.8 x 11.5cm) pocket strip and 2 hearts from felt scraps. Cut 3/8” (1cm) wide grosgrain ribbon in 2 equal lengths. Cut tape measure off at 39½” (100.5 cm). 2. Assemble: Center and pin felt pocket strip to one end of plaid ribbon. Zigzag or use a decorative stitch along sides of felt pocket. Loop one narrow ribbon through scissors. Pin ribbon ends at raw edge of plaid ribbon and machine baste. Layer heart motifs together. Edgestitch, leaving 1¼” (3.2cm) top opening. Fold other narrow ribbon in half; center and tack fold to inside heart pocket. Center and machine baste ends to other plaid ribbon raw edge. 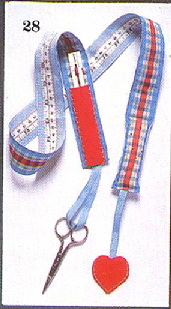 Center tape measure on wide grosgrain ribbon. Edgestitch tape on all sides. With right sides together, stitch wide grosgrain to plaid ribbon with ¼” (6mm) seam across “heart” pocket end. Turn and press. With wrong sides together. edgestitch ribbon sides. 3.Pin Cushion: Measure 4¼” (11cm) from open end, stitch across. Stuff tightly. Turn ¼” (6mm) raw edges inside and stitch closed.